Could The PS5 Be a Portable/Console Hybrid? There are those out there who still champion the PlayStation Vita and wish it hadn’t met an early demise. It’s true that Sony’s portable systems, while well made, have never been able to compete with Nintendo’s offerings. Now that Nintendo has released the Switch, they’ve managed to merge the concept of a console with a portable. Is it possible that Sony could do the same thing? After all, portable experiences are big for many people who often commute to work, or rarely have time to camp out in front of the TV. It’s no secret that the Switch is going well for itself, so that begs the question, could the PS5 be a portable/console hybrid as well? It may be more of a possibility than you think. Before you shoot down the concept, let’s look at the facts. In early 2017, NeoGAF user ponpo spotted a patent that was filed by Sony back in 2015. It wasn’t published until 2017, but the images associated with it look suspiciously like the setup Nintendo has with the Switch. While it’s true that patents don’t always become products, it does show that Sony is entertaining the idea. While the images don’t immediately show the ability to detach the controllers on either side, it’s reasonable to assume that this function is possible, just like the Switch’s Joycon controllers. Much like the Switch, this patent could be for a system that allows you to place the tablet into a dock and play games on the TV, or take them on the go. I don’t think, after the lack of support for the PSP and Vita, that Sony will go into the handheld field a third time, so that makes me think that they’re going to use this in conjunction with the PS5 somehow. It’s clearly an idea that works. Nintendo has enjoyed sales in excess of 7.63 million units worldwide through September 2017. Keep in mind, that the console was released in March of 2017, so those numbers are pretty impressive. Even more interesting, is that the Switch has managed to outpace the sales of the PS4 in Japan! These kinds of statistics show a shift in gaming where graphics aren’t necessarily everything. If you can change the way games play, then you can easily take on the giants of the industry. So, let’s entertain this idea for a while. What would the PS5 look like if it was a portable/console hybrid? Let’s fast forward to a hypothetical E3 2018 where Sony announces the PS5. It will still be the PlayStation console you know and love, but with some added twists. While the Nintendo Switch doesn’t have the same hardware power as its contemporaries, Sony is not one to be beaten by Microsoft’s hardware. Now, I know what you’re thinking? How are they going to get that kind of power into a portable device? In short: they won’t. Technology may be remarkable, but I’m not willing to bet that we’ll have that kind of tech in a portable device by the PS5 launch. No, the PS5 will offer the most cutting-edge home console technology we’ve ever seen when hooked up to your TV. When you need to play in the bedroom, share the TV, or head out to explore the world, you’ll be able to detach a tablet device from the console. This device could be used solely for portability, or it could be used in tandem with the DualShock 5 when you’re playing at home. Think of it like a second screen to use while you’re playing that can display vital information separate from the TV screen. It won’t be on your controller necessarily, it could be propped up using a stand on a coffee table, or left attached to the PS5 when you’re not using it. It will most likely charge off of the system as well. When you’re heading out or playing away from your TV, you’ll simply detach the tablet, and then split your DualShock 5 in half. Oh yes, in this version of PlayStation’s future, our beloved DualShock is also a transforming portable controller. 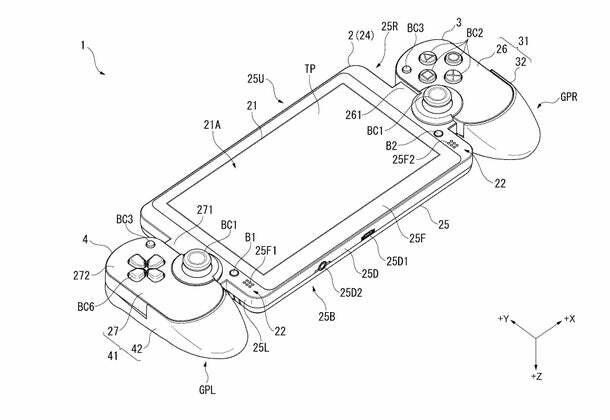 By separating the Dualshock 5 into two parts, you will then connect it to the sides of the tablet as shown in the patent. Now, here’s where things get hazy. Since we can’t put the PS5 tech into a tablet, we’re going to need some sort of advanced streaming that can allow the PS5 to display games on the tablet in real time wherever you are. While we don’t have that exactly, we do have something that could evolve to meet these needs. I’ll give you a guess, it’s two words and the Vita used it. Yes, we’re talking about Remote Play. Remote Play Evolved: The Key to a Portable PS5? Currently, the PS4 has a feature called Remote Play that allows you to stream games from your console to your PlayStation Vita, or more commonly, to a PC or Mac computer. The caveat here, is that that you’ll need access to a strong internet connection to really have a good experience. The concept behind remote play is so strong, but the execution holds it back. On the one hand, we could argue that Sony should sacrifice power to make the system portable, which is precisely what Nintendo did with the Switch, but I don’t think any portable aspect of the PS5 will be a primary focus. Instead, we have two options: Sony develops a sort of Wi-Fi hotspot technology to give you a strong connection anywhere you go, or Wi-Fi proliferates into something you always have access to wherever you go. If that were the case, then remote play on the PS5 with a custom tablet and split DualShock 5 controller isn’t so far-fetched. Google began pioneering the concept of public Wi-Fi with free internet at railway stations in India. They’re taking the next step with a new initiative called Google Station. There is now public Wi-Fi available at cafes, malls, and all kinds of public places. They’ve expanded across India and Indonesia, but Google is looking to go worldwide with this concept. They’re reaching out to ISPs to strike deals and get internet access to more people. It may sound crazy, but with a company like Google behind it, this idea has a strong chance of becoming something revolutionary for public internet. This is a separate initiative being pushed forward by Facebook, and while it doesn’t connect to gaming per se as it focuses on bringing internet to third-world countries, it does push forward the concept of internet for all, and constant access. What is truly fascinating is the concepts pitched in their Connectivity Lab. For example, they are using an Aquila Unmanned Aircraft that soars 60,000 feet above the Earth, to beam internet access down to otherwise unconnected areas. With a wide wingspan, and solar panels to power it, the craft can stay airborne for months at a time. This type of technology could be the precursor to a worldwide Wi-Fi network that everyone can tap into. As you can see, it’s not crazy to think that we would have much better and much more prevalent Wi-Fi in the future that could support an evolved version of Remote Play, and by extension, a portable PS5 console hybrid system. What do you think? Should the PS5 have a portable element, or should Sony just double down on the console aspects of the system? Let us know in the comments! They should release the PS5 in the middle of 2021.